THPRD provides gardening opportunities at 12 sites within the district. For more information, call 503-629-6300. Meet other gardeners, grow your own produce, and even invite friends to join you in one of THPRD's community gardens. 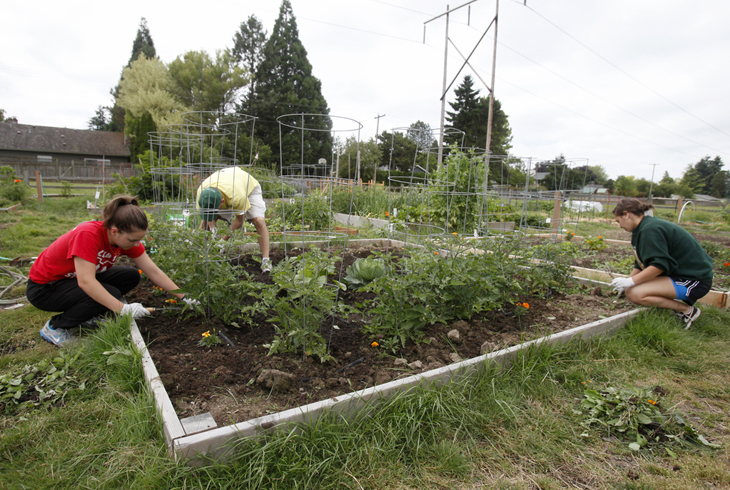 If you are interested in renting a community garden plot, contact Jessica Kittleson at (503)645-6433 or jkittles@thprd.org. Please include your full name, address, phone number and e-mail in all correspondence and requests. Garden plots are rented for a full calendar year. Current users are given the option to renew their existing plots before they are made available to other gardeners. THPRD provides irrigation for all community garden sites from April through mid-October (weather permitting). The use of plastic and newspaper as mulch is not allowed. The gardener provides his/her own equipment (hoses, sprinklers, tools, etc.). Other than small rototillers, motorized vehicles and equipment are not allowed in the garden. It is the renter’s responsibility to maintain a weed-free garden. If you cannot maintain your space, call THPRD at 503-645-6433 so arrangements can be made for someone to take your place. Flowers and produce may be grown for personal use only. Please respect other gardeners’ spaces; do not pick vegetables, fruits or flowers that are not yours. Please do your part to conserve water by hand watering plants before 10 am or after 6 pm. Help avoid water loss and report all leaks. Gardeners will supervise children and are solely responsible for the behavior of guests. No pets are allowed in the garden area, with the exception of service animals. Tires and rocks are not allowed at the garden sites. The use of chemical pesticides and herbicides is not allowed in THPRD gardens. Green waste box available for communal use. Green waste pickup will occur the last week of the month, April-October. Time frames are subject to change. For more information about community gardens, please contact Jessica Kittleson. T: (503)645-6433, E: jkittles@thprd.org, F: (503)629-6301. Green waste is picked up the last week of each month, March-October, on your park's scheduled maintenance day. In November the final pick-up will happen the 3rd week.